Welcome to the home of the Whitehorse Chevaliers Fencing Club! 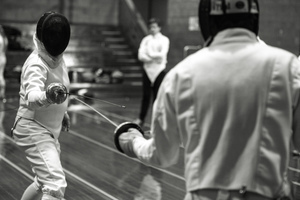 The Whitehorse Chevaliers provide the opportunity for community members in outer eastern Melbourne to learn and participate in the sport of fencing. We aim to support our members to achieve their goals, whether they fence for fun, fitness or serious competition. The club welcomes beginners of all ages, and provides a friendly and relaxed environment in which to start fencing. Our club includes adults across a range of ages, parent/teen fencing families, individual teenagers and juniors aged U13. We currently offer training sessions in Nunawading on Saturday mornings, Mitcham on Tuesday nights and Thursday afternoons, and a session in Olinda on Thursday nights. We offer introductory sessions; beginner classes for people who are new to the sport; junior classes; and access to equipment, coaching and competitions. Interested in becoming a member? Come and check out one of our training sessions at any time, chat to a coach and have a go! Our club is running two free sessions for women and girls interested in trying fencing. Check our Prospective Members page for details!